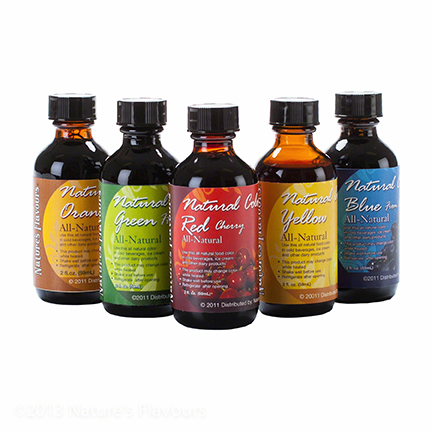 Nature's Flavors Natural Colors are food coloring or food dye that are all natural! These dyes are vegan, gluten-free, and chemical free! Colors include orange, green, red, yellow, and blue. 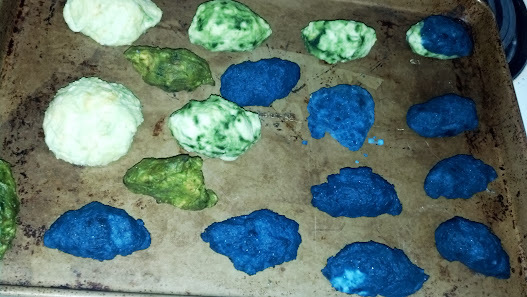 We tried these dyes in our applesauce as well as to make dinosaur eggs for my son's birthday party. Read on to learn about our experience with these natural food dyes. 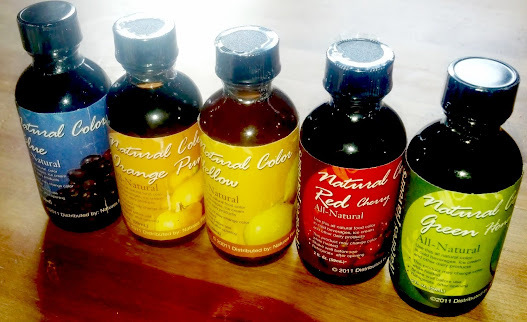 We received a pack of Nature's Flavors Natural Colors to review. I was very pleased with the large bottles (each bottle contains 2 oz.) and the range of rainbow tones available in this natural food coloring. Some benefits of the Nature's Flavors Natural Colors food coloring include that that they are natural, vegan, gluten-free and chemical-free. Why is it important to have natural food coloring and food dyes? Not only are natural colors important for families who are trying to eat a natural and healthy diet, but Nature's Flavors also advertises that their colors are a great step forward for families with children who have ADHD or are hyperactive. I know that many families with children who have ADHD or hyperactivity issues specifically avoid commerical dyes because of the adverse effects that these dyes have on their children and their children's' actions. These dyes could be a solution for families who want to add color to their foods and crafts, but want to avoid traditional food colorings and food dyes. 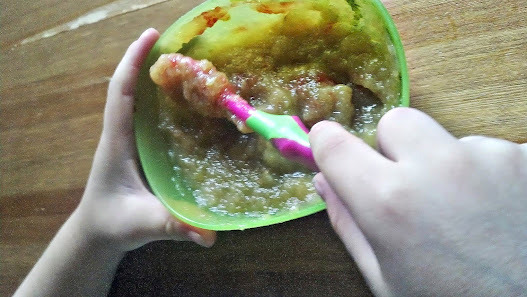 Our first experiment with the natural food coloring was to color my son's applesauce snack green and red. (He chose the food and the colors.) We had fun mixing in the colors and my son said the applesauce tasted the same as it usually did. 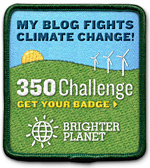 I did, however, notice that the red dye smelled unpleasant to me, and I was glad that it didn't seem to bother my son. One thing I did notice while we were mixing up the applesauce was that the dyes warned that baking or otherwise heating the food coloring might change the colors. I was disappointed in that because I had been hoping to dye some cupcakes or cake batter with these colors. 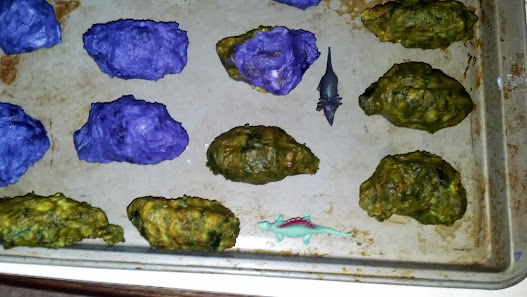 For my son's birthday party, I decided to make "Dinosaur Eggs" out of baking soda and dye. (You can find the exact recipe for Dinosaur Eggs here.) These would not require baking and would be a great use of the dye, so I combined the dye with the baking soda and went to work. 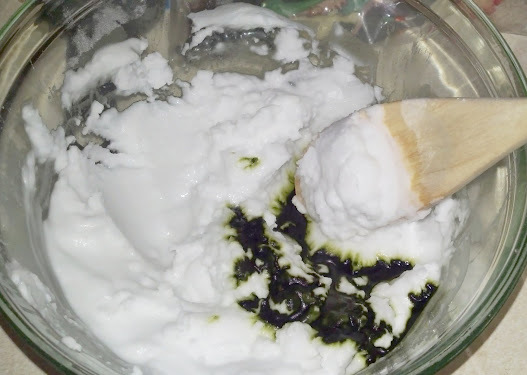 You can see that the Nature's Flavors Natural Colors dye made great designs with the baking soda. I made green eggs, green/brown eggs, purple eggs, and blue eggs. The red dye was red on my hand, but actually turned purple when it hit the baking soda. You can see the size of the eggs below. Check out how the colors turned out! I think the colors from the Nature's Flavors Natural Colors dyes turned out perfectly. I was specifically going for a mottled and non-uniform look, and I am very pleased with the results. In the end, the eggs weren't quite as dry before the party as I would have liked, so I popped them into the oven for 15 minutes at 200 degrees, knowing well that this might change their colors. However, the colors in the dye stayed the same even with the heat. I wanted to note that the dye stained my hands less that I had expected. I washed my hands after every color and in the end my hands were slightly darker, but I'm not sure that anyone else would have noticed. I was very pleased! And now, the bad news: I was feeling quite nauseated from the smell of the red dye and and least one other of the colors. I finished the dinosaur eggs and went up to bed. Just after I got in bed, I had to run to the bathroom to throw up. I almost never get nauseated enough to vomit, so I wondered if I were pregnant. I even took a pregnancy test because I've only ever felt that sick when had morning sickness. The result? Not pregnant. So getting sick was a pretty sad result of making these dinosaur eggs. I can't be sure if it was just a coincidence, whether it was because I was working with such a large amount of the dyes, or what. Overall, I think these natural dyes are headed in the right direction. I am happy that there are natural options out there for food colorings. However, because I became so sick after using the dyes to make the dinosaur birthday eggs, I cannot strongly recommend them to others.